We collect government documents and materials in three primary areas, United States Government Documents, State of Mississippi Documents and Maps. For more information about the Government Documents Collection please see our Collections Policy page. Designated as a Federal depository in 1883, the Library’s collection has grown to include over 800,000 paper documents, 1.5 million microforms, and over 110,000 maps. The historical print collections date from the beginning of the 19th century and include many reports of government-sponsored scientific and ethnographic explorations. The Library also owns the entire nineteenth century Congressional Serial Set and provides full-text access via Proquest Congressional. Significant components of the collection include census reports and USGS, DOE, EPA, and NASA technical reports. Recent documents are available in CD-ROM or on the internet. The bulk of the federal depository collection is located on the ground floor of the library on the Lyceum side (see map). Most documents can be checked out (see Government Documents: Lending Policies). The nineteenth century collection is stored in the Library Annex. These items will be retrieved on request. Virtual access to more than 400,000 publications is available via the library catalog and One Search discovery service. 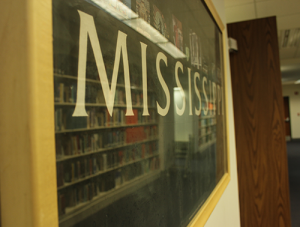 Although the State Depository Program wasn’t legislated until 1966, the Library’s collection includes significant historical Mississippi documents from the nineteenth century such as Department Reports, the Laws, and Senate and House Journals. The entire state documents collection is cataloged and searchable in the library’s online catalog. State Documents are located on the ground floor of the library adjacent to the Interlibrary Loan office. The maps collection consists of more than 250,000 federal depository maps and charts from government agencies. Current and historical topographic maps of all fifty states and territories from the U.S Geological Survey comprise the largest part of this collection. Many are also available for sale or downloading from the U.S.G.S. website. They are organized within states by map name and filed flat in map cases. Aeronautical charts are issued by the FAA. Examples of these can be found at http://www.faa.gov/air_traffic/flight_info/aeronav/productcatalog/. The collection also includes thousands of agricultural, recreational, political, economic, and statistical thematic maps from almost every federal agency. These include maps of national parks and forests, CIA maps of foreign countries, congressional district maps, and soil survey maps. All these maps can be checked out for a two week loan.